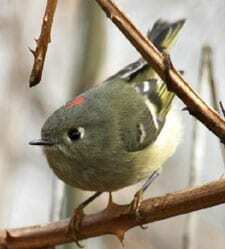 A tiny bird seemingly overflowing with energy, the Ruby-crowned Kinglet forages almost frantically through lower branches of shrubs and trees. Its habit of constantly flicking its wings is a key identification clue. Smaller than a warbler or chickadee, this plain green-gray bird has a white eyering and a white bar on the wing. Alas, the male’s brilliant ruby crown patch usually stays hidden—your best chance to see it is to find an excited male singing in spring or summer.